In Customer Experience Rules!, CX expert Jeofrey Bean gives 52 best practices for a company to create a great customer experience. Going beyond branding, customer service, and customer satisfaction, the customer experience encompasses every touch point a customer has with a company. Follow these rules in your business to craft the very best customer experience possible. Bean shares innovative yet practical insights about effective customer experience strategy and tactics from the leaders to improve customer engagement, loyalty, and advocacy: including Uber, Tesla, Amazon, Qualcomm, Kaiser Permanente, DealerRater, Imprivata, Ford, Starwood Hotels, and more. Bean is the author of two Customer Experience books that help companies whether they are beginning to learn about CX, or are well on the way to integrating customer experience into the DNA of the company. 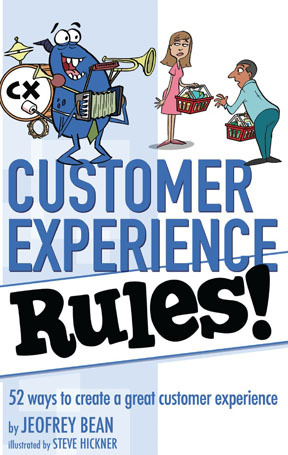 Like his best-selling CX book, The Customer Experience Revolution, Customer Experience Rules! is based on the author’s experience, research, and in-person interviews with companies recognized for CX innovation. ​Read one rule a week—or all 52 at once! Customer Experience Rules! is your guide to customer experience success. "​Whether you are new or a long-time practitioner of Customer Experience, this book is a great introduction and reminder of all the best practices we should use – every day!" "Customer Experience Rules! is a must-have book for companies beginning to focus or companies re-focusing on the experience of the customer." "If you worship at the altar of Customer Experience, these are your 52 weekly devotionals."